PERFEKTE ANGEBOT FÜR DIESE GÄSTE, DIE WÄHREND DES TAGES DIE INSEL UND DIE STRÄNDE ENTDECKEN WERDEN! Das Kahana Reef plant tagsüber Reparaturarbeiten an der Ufermauer. Die Bauzeiten sind von Montag bis Freitag von 8 bis 17 Uhr, mit schweren Bauarbeiten nach 9 Uhr. Die Arbeit erfordert schwere Maschinen, die während Ihres Aufenthalts laut und störend sein können. Makai-Rasenflächen sind in und um das Baugebiet, beginnend am Südende, verboten. Der Pool kann oder kann nicht irgendwann geschlossen sein. Das wird bestimmt, wenn sich die Arbeit näher an den Poolbereich bewegt. 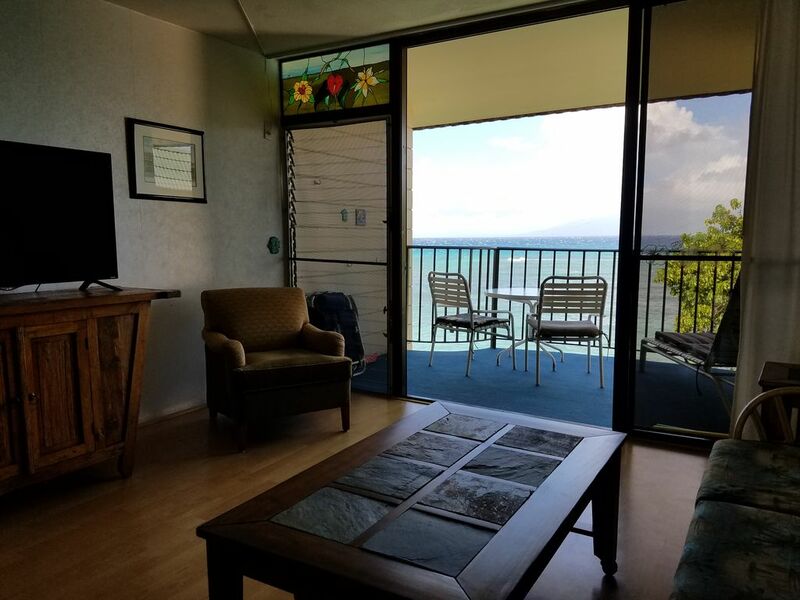 Unser "Maui Getaway" befindet sich in einer sehr ruhigen Umgebung in der obersten Etage eines Wohnkomplexes direkt am Meer. Entspannen auf unserer privaten Terrasse genießen einige Kona Kaffee ist der perfekte Weg, um Ihren Tag zu beginnen. Man weiß nie, was Sie sehen, während Sie das Ocean Reef von hier: Buckelwale während der Wintersaison, Delphine, Schildkröten, Adlerrochen, und gegebenenfalls eine Hawaiianische Mönchsrobbe, die eine sehr seltene Website hat. Dies ist auch ein idealer Ort, um den Sonnenuntergang über der Insel Lanai genießen Sie einfach oder lehnen Sie sich zurück und beobachten Sie die Kajakfahrer, Schnorchler, Schwimmer, und manchmal sogar Surfer. Kahana Reef verfügt über einen Pool am Meer nur auf dem Bürgersteig und 2 Jenn-Air Gasgrills von der Liegewiese. Es gibt Aufzüge entweder Richtung von unserer Einheit für einfachen Zugriff auf die Spitze (4) Boden. Es gibt eine Waschküche vor Ort mit 6 Waschmaschinen & Trockner. Wenn Sie nach einer ruhigen Oase oder einen romantischen Kurzurlaub suchen, das ist es! Das Rauschen der Wellen und die sanfte Brise der Passatwinde sind sicher, dass Sie schlafen nachts wiegen. Der majestätische Insel Molokai ist auch aus der Küche, die komplett mit Töpfen, Pfannen, Geschirr, Gläser, Grillen Utensilien, Kaffeemaschine, etc. sichtbar Es gibt einen Flachbild-TV, Kühler, Spiele und Bücher für Ihren Genuss. Darüber hinaus gibt es in der Wohnanlage ein gesichertes WLAN-Internet. Kahana ist der perfekte Ort mit Championship-Golfplätze und einige der "Americas Best Beaches" innerhalb eines 10 bis 15 Minuten mit dem Auto entweder Richtung vom Komplex entfernt. Also, worauf warten Sie noch? Entfliehen Sie in unserem "Maui Getaway" und Sie sind sicher, zurück, wie viele unserer Gäste zu tun. Es gibt ein Buch Austausch von Sorten von der Waschküche. Innerhalb der Wohnanlage finden Sie Kühler für den Strand zu finden ... eine Thermoskanne Kaffee, um den Sonnenaufgang am Haleakala ansehen ... Ferngläser zur Walbeobachtung von der Veranda ... Wäschekorb, Bügeleisen und Bügelbrett ... Brettspiele und Filme. 100% Erstattung für Stornierungen bis zu 60 Tage vor Anreise. 50% Erstattung für Stornierungen bis zu 30 Tage vor Anreise. We loved the view and even saw a breech and fluke from some humpbacks off the balcony 3/4’s of the way.to Lanai. Quiet and relaxing stay. Suggested a lubricating of the sliding glass doors. Condo we pretty clean. Found the satellite went in and out at times. Overall, would stay here again. We loved staying in unit 414, its quiet with a beautiful view. Everything was clean with a breeze flowing through. It's close to everything and just down the street we found the best snorkeling spot with lots of turtles. We were very lucky to have found this place. Thanks Sue. Lovely condo with an excellent view. Really enjoyed our few days at Kahana Reef. The entire property was very clean & well maintained. My husband and I stayed in this unit for 10 days in June 2016 and I truly cannot say enough about how wonderful our experience was. The owner is incredibly timely and easy to communicate with, she gave great information about the surrounding area as well as instructions on how to get to and in to the condo so we were never confused or worried about getting there and "checking in". The condo itself is stocked with every imaginable item you will need in a home away from home, the kitchen is brimming with all utensils, small appliances, pots, pans, tupperware you name it, makes it incredibly easy to step right in and prepare a meal or pack a few things for the beach. There are cooler, chairs, boogie boards, snorkel equipment as well, this really is a show up and enjoy kind of place! The internet worked great and was strong so we could always stay in touch. The bed and furnishings are all clean and very comfortable and last but very not least the view from the 4th floor deck is unmatched, we sat out there almost every second that we were in the condo because something was always happening out on and in the water...turtles floating by and surfacing, rainbows, sunsets and beautiful breezes. We loved this location on the coast as well, quick 15 minute drive to Lahina, 10 to Kaanapali and just minutes from Napili. Lots of restaurants and shops in the surrounding area so we never needed to go far from home if we needed something quick. The complex pool is great, the small beach right next to the property (stairs leading down to it right from the yard) is perfect for jumping in for a swim, paddling from or snorkeling out of. We just loved this condo and everything the area has to offer! This condo has a wonderful view of the ocean and sits on the top floor so there is no extra foot traffic. The condo is small but was clean and very comfortable for the three of us.There is eating places within walking distance and access to a small beach area. In order to hold your reservation, we require ½ of your total be submitted within 14 days of confirming reservation. The balance is due no later than 30 days prior to your arrival date. Cancellations are subject to a $75 cancellation fee. If you do not cancel your reservation prior to the 30 days before your arrival date, your deposit will be forfeited. Rufen Sie bei Fragen zu Buchungen FeWo-direkt unter 08003225225 an.